Hibiscus is a deciduous, flowering shrub with large showy flowers (in single or double flowering form, with solid colours or bicolours) that blooms all summer long. This woody perennial is native to India and East Asia and not, as Linnaeus thought, to Syria, in spite of the name he gave it. As for the common name ‘Rose of Sharon’, the plant should not to be mistaken for Hypericum calycinum (also known as St John’s Wort), which in the UK and Australia is sometimes also called Rose of Sharon. Unlike our common Tropical Hibiscus (Hibiscus rosa-sinensis), Hibiscus syriacus will help bring a bit of tropical beauty to more temperate climates. It is hardy to about -20° C (-4° F) when mature, but when planted in colder areas, it will need protection for the first few winters – be sure to mulch well. 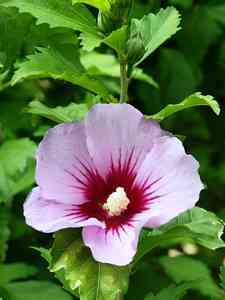 Although hardy, Rose of Sharon actually prefers heat and will bloom better with hot summers. in shades of white, pink, red, lavender, or purple – often with a different spot of colour in the middle of the throat. The flowers can be single or double and appear from midsummer to early autumn on current season’s growth. Individual flowers are short-lived, lasting only a day, however, numerous flower buds are produced which provides prolific flowering over a long period. The flowers are hermaphrodite (have both male and female organs) and are pollinated by insects attracted by flat blossoms and nectar. The fruit are seed-capsules and Rose of Sharon can be very invasive due to the numerous seeds produced in the capsules. Snip them off before they open, or choose one of the newer cultivars that are genetic hybrids – the triploids. These produce few (if any) seed capsules. Hibiscus bush blue The leaves of the shrub are medium to dark green, 2-4″ (5-10 cm) long, often with 3 lobes, and jagged edges. Don’t be surprised if the leaves arrive after most of your other plants. Its leaves usually start to show around the end of spring or early summer, causing false alarms in gardeners who think their plants may have died. The leaves hold late into autumn before turning a yellowish green. 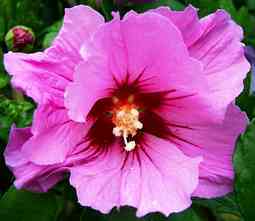 How to Divide & Transplant a Hibiscus : Gardening Tips. Hibiscus are some of the most beautiful flowering shrubs in the tropical garden. Divide and transplant a hibiscus with help from a certified professional horticulturist through the American Society for Horticultural Science in this free video clip. 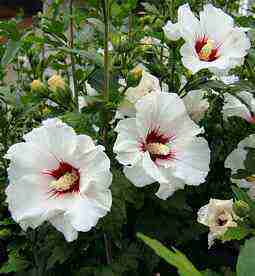 To give the best growing conditions to your Hibiscus, plant it in a place with full sun as it likes hot weather. It will also tolerate partial shade. 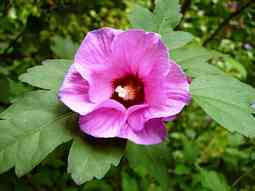 Rose of Sharon grows best in moist, well drained soil that contains lots of organic matter, though happily it is able to tolerate a wide variety of soils. 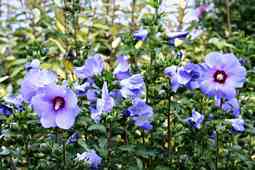 It is an easy to grow plant because of its relatively rapid establishment and can be easily transplanted without being disturbed too much. When it is newly planted be sure to water every few days until established. When mature, Rose of Sharon is somewhat tolerant of drought conditions, but the buds may drop if the plant is watered too much or too little, or if too much fertilizer is applied. 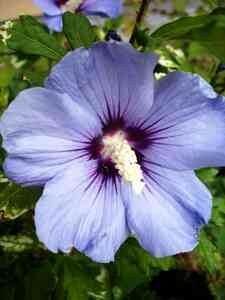 Rose of Sharon has a medium growth rate. Branching begins near the ground with numerous vertical branches. The natural growth pattern for the shrub is upright with spreading branches that develop into a vase-shaped profile. It can reach up to13 feet (4 m) in height. If not pruned, the limbs tend to arch away from the center as the plant ages. Though it is naturally a multi-stemmed shrub, the lower limbs are sometimes removed to present the shrub in tree form. It can also be trained as an espalier or shaped into a hedge. Since plants bloom on new growth, shaping or pruning can be done at any time. Prune as needed to maintain the shape desired. In winter or early spring, last season’s growth should be pruned away, which will help produce bigger blooms (In northern climates, prune only in late winter or early spring to avoid frost damage). Rose of Sharon is the perfect shrub for groupings and mass plantings, to create a screen, or planted as a formal or informal hedge or in a shrub border. Standard forms may be used as small trees or next to entrance ways. Be careful when using this as a specimen plant – remember that the leaves appear late in spring and the blooms do not show until later in summer. Though prized for its profuse blooming throughout the summer, the shrub is less ornamentally attractive in late autumn. 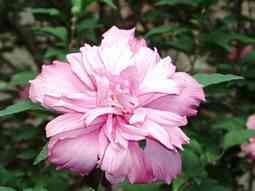 Hibiscus syriacus is fairly easily propagated from either seeds, with variable results, or by layering or cuttings, cloning the original. 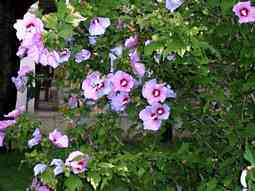 Though it has little winter interest and can be stiff and ungainly if badly pruned, Rose of Sharon remains a popular ornamental shrub with many cultivars. It is a beautiful and delightful shrub that will give you years of charming flowers just when you need them in the late summer and autumn. Hibiscus Hibiscus syriacus, also called ‘Rose of Sharon’, ‘Althea’, or ‘Hardy Hibiscus’ is a deciduous, flowering shrub with large showy flowers (in single or double flowering form, with solid colours or bicolours) that blooms all summer long. Stem Cuttings Of Tropical Hibiscus. HIBISCUS – A Passion Forever.- Describes the passion for those magic plants that lead the author to discover some of the secretes they hide, and that will allow you to get your own bigger blooms, enhanced colors, more healthy plants that will bloom all year round and increase the average number of hibiscus seeds per pod. Through the years, I have developed my theory that hibiscus make you feel younger. Not only have they brought energy and life to an 88 year young friend of mine, but they have also been chosen by young people to show they are surfers. 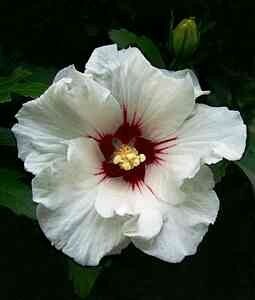 Hibiscus is a flower that proclaimed on it’s won: “I stand for life, for fun, for youth, for enthusiasm, and so on”. Even lovely young girls adorn their hair with them in summer. Every seed is a new dream, a new project, all by itself. It can grow into something glorious, or it can show very faint colors, it can be huge or very small, it can have one row or petals, or bear petaloids or frills, but it will never cease to astonish. The book is written in a way that will encourage you to grow your own hibiscus from seeds and achieve the joy and fulfillment of producing your own unique plants, and be the first one in the world to see that first unique bloom. The book is full of wonderful and colorful hibiscus pictures that will introduce you to Hibiscus Magic. Growing Hibiscus is a passion for creation, and it makes you feel you are doing magic. I can hear the “Wwooowws” from many hibiscus friends worldwide whenever one of us has bred a stunning seedling with unique pattern and color combination. 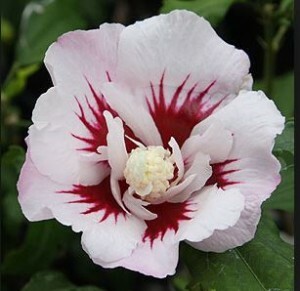 Hibiscus syriacus, also called ‘Rose of Sharon’, ‘Althea’, or ‘Hardy Hibiscus’ is a deciduous, flowering shrub with large showy flowers (in single or double flowering form, with solid colours or bicolours) that blooms all summer long.